In 2010, with his New York Times Bestselling book The Paleo Solution, Robb Wolf presented the answers that enabled me to recover my health. His podcast of the same name launched my business and connected me with the incredible partners who helped shape NBT into an online clinic that has now helped over a thousand athletes achieve optimal health and performance. 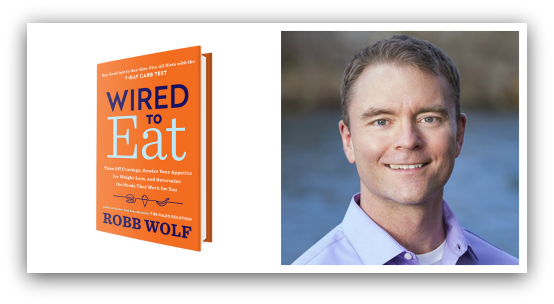 In his new book, Wired to Eat, Robb carefully examines the neuroregulation of appetite as this is necessary for eating enough to be healthy, but not so much that we see weight gain and the plethora of Western degenerative diseases such as cardiovascular disease, neurodegeneration and type 2 diabetes. Robb's primary goal with this material is to remove the guilt and shame many people feel around making changes in their food and movement. We STILL need to do the work, but if we understand this may legitimately be a challenging process, we can avoid the sense of failure and self-loathing. Mixed into all this Robb talks about sleep, photoperiod, stress, digestion, the gut microbiome, autoimmunity. It’s a lot of material, but we think it covers most situations and will be helpful whether one is struggling with weight or is a top tier athlete. Learn more about Wired to Eat, including the special launch bonuses! One piece of simple, actionable advice to improve your health and performance, including the reference(s) to back it up. One item we read or saw in the health and fitness world recently that we would like to give a different perspective on, and why. One awesome thing that we think you’ll enjoy! [00:00:41] Robb’s first book was The Paleo Solution: The Original Human Diet (2010). [00:01:31] The Paleo Solution podcast. [00:01:51] Amelia Luker, RN, is my ultra hard working employee #1 who makes much of the NBT of the magic happen. [00:02:44] Marty Kendall has a fantastic website and Facebook group both named Optimising Nutrition. [00:04:25] Sign up for our weekly highlights email. [00:05:35] The first book was so successful, why write a second? [00:06:38] Customisation was lacking in the original approach. [00:08:09] We are wired to eat. [00:10:52] Most health and fitness books are ghostwritten. [00:12:55] Why not a retreat, or a training course, or self-publish? [00:13:56] Tucker Max: Book in a Box. [00:14:46] Reno Risk Assessment Program (explicit). [00:15:45] Lorain Cordain and Gary Taubes. [00:16:30] 22M savings, 33:1 return on investment. [00:18:51] Workman's comp 1.5M cost? [00:24:46] William Cromwell, MD, Discipline Director, Cardiovascular Disease at LabCorp. [00:27:14] Ivor Cummins (aka The Fat Emperor), and the late Dr Joseph Kraft. [00:32:41] Continuous glucose monitoring (CGM). [00:34:29] Zeevi, David, et al. "Personalized nutrition by prediction of glycemic responses." Cell 163.5 (2015): 1079-1094. [00:37:39] Glucose challenge in hunter gathers. [00:38:58] Does one size fit all for glucose tolerance? [00:46:00] The septic patient. See Robb’s talk at UCSF. [00:50:58] Straub, Rainer H., and Carsten Schradin. "Chronic inflammatory systemic diseases An evolutionary trade-off between acutely beneficial but chronically harmful programs." Evolution, medicine, and public health 2016.1 (2016): 37-51. [00:58:27] Crossfit and martial arts. [00:59:56] What should I do when I grow up? [01:04:58] Cleveland Clinic Functional Medicine. [01:07:33] f you own a gym or other business and would like to sell copies of Wired To Eat you can pre-order in bulk! Please send email to hello@robbwolf.com with “Bulk order” in the subject line for details.